Getting a tattoo done can be a fun and exciting experience, but don't get one you will regret. Before going to a tattoo parlor, decide on a design you want. There are a number of ideas you could use for the design, but the final decision is yours. Don't let anyone else influence your decision, or you might regret it later. So what are some good tattoo design ideas? 1. A Memory. One good idea for a tattoo design is from one of your own memories. It could be to honor someone who has passed away, in honor of a child, or maybe even a pet. It could also be in honor of a trip you made or an accomplishment in your life that you don't want to forget. You could make the design a literal interpretation of the memory, or make it more symbolic so only you and maybe a few people know what it relates to. 2. Quote or a Saying. Another common idea for a tattoo design is to simply get a quote or saying. These are most often from a famous person. Whether it's from a poet, a chinese proverb, a celebrity/other famous person, or just one symbolic word. Anything could work. Plus, the quote/saying tattoo design is very versatile, as it can be placed nearly anywhere on the body and still have aesthetic appeal. 3. Famous Painting or Drawing. If you are looking for a larger tattoo, using a painting or drawing as a reference is a great idea. It could be from someone famous or from a lesser known artist who you really admire. It could even be a family members' art work if someone in your family paints or draws. Since a lot of paintings are relatively larger, this is a good idea for a tattoo that will take up a bit more space. 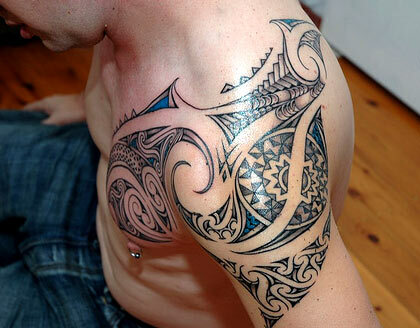 Typically, ideas like this are seen on the broad space of ones back. However, given the painting or design, some good ones can be wrapped around the forearm in the classic tattoo sleeve. FBI wants a tattoo database!